“DAILY PIO, HEALTHY JIO”, the commercial was the only way most of us recognise the brand “YAKULT”. 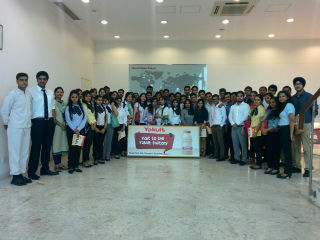 On August 3rd & 4th, 2015, the students of PGDM I year, JIMS Rohini went for an Industrial Visit to Yakult Danone India Pvt Ltd. The Yakult manufacturing plant with ISO9001: 2008, HACCP and OHSAS 18001:2007 certified state-of-the-art facility is located in Rai, Sonepat, in Haryana. On arrival the students were addressed by factory representative Mr Vikas who gave general guidelines related to conduct and safety in the facility premises. The group was ushered in the presentation hall where they were introduced to the world of probiotics and the journey of Yakult since beginning. 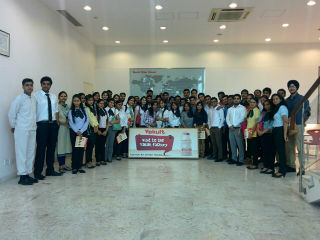 The second stage was factory tour where Yakult’s production process was shown to the students. The process is highly mechanised and the plant has a capacity of manufacturing 1 million bottles per day. The students could relate to management fundamentals like marketing, distribution,processing, labelling, quality testing, demand forecasting, production planning, packaging, procurement, supply chain, distribution and general management. They could also understand the importance of planning and time sowing to perishable nature of the commodity along with storage conditions. Students asked question related to competitors, promotion, advertising, retail and institutional customers which were satisfactorily answered by the host. The memories of the visit were captured in photographs. It was a great experience sojourning the factory premises. All in all it was a trip both for enjoyment and education.